I have had numerous requests to repost some of his photos. Some will have the original stories, some will not. I hope that you enjoy looking at Bill's photos. 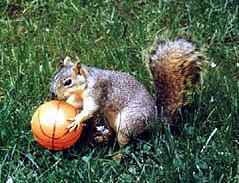 This is one of the Portland Squirrel Blazers practicing his three pointers before the next big game. This shot went off the outhouse, over the bridge and through the basketball hoop with nothing but net. 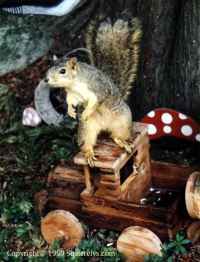 Here's Snoopy getting ready to head for Squirrelys Bar. You'll notice he has been driving the car more lately than flying. After that last crash into the outhouse, he hasn't been quite the same. 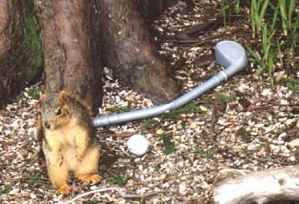 This is Tiger the Squirrel Woods just flabbergasted and looking around to see if anybody was watching while he whiffed his ball and wrapped the club around the tree at the same time. After wrecking the plane so many times that we have all lost count, rustling Easter eggs, and running moonshine, Snoopy's still trying to find his thing in this world so who knows where this is going to end up. With spring in the air I thought he would be out playing squirrel tag, but he doesn't seem to be into those type things. 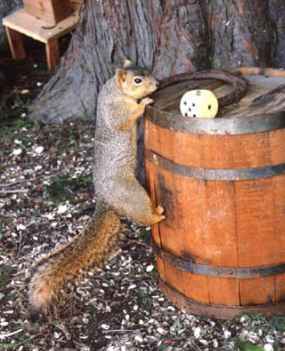 Here's Snoopy teaching me how to play craps squirrel style. If the number doesn't come up on the top he climbs around the side till he gets the number he's going for. I told him that he should be using two dice and he told me to stick to slot machines and keno something simple if you get my drift. See ya in a few weeks.